Dale un sábado a nuestra comunidad para que sea un lugar mejor. 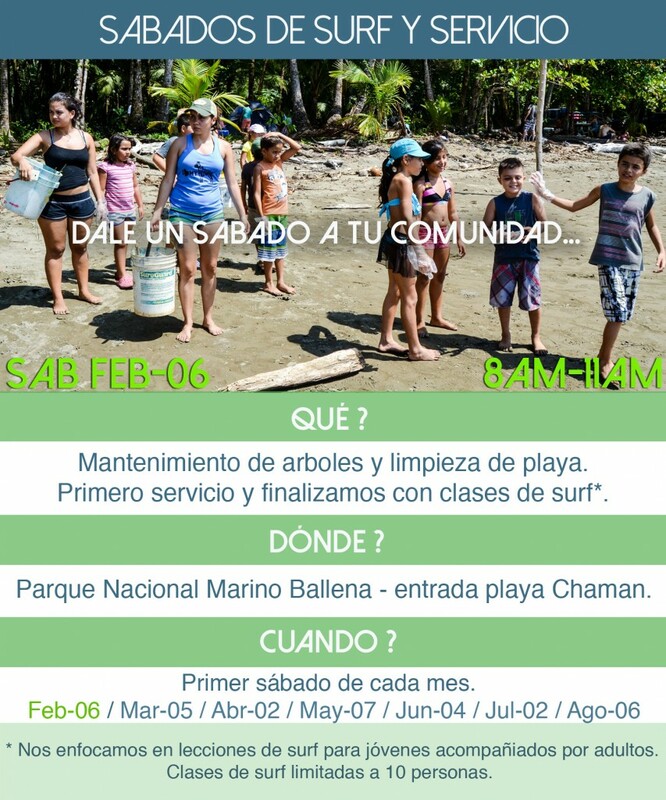 A partir de ahora hasta agosto de 2016, únase a al programa Sábados de Surf y Servicio en PNMB para hacer servicio comunitario. Para aquellos que participan en la actividad de servicio, se ofrecerán clases de surf, centrándose en la juventud. También tendremos fútbol en la playa o simplemente disfrutar de la playa con otros participantes. Las actividades de servicios varían por mes, pero el servicio se enfocará en el mantenimiento de los árboles sembrados en el parque como parte del proyecto Semilla de Ballena, haciendo limpiezas de playas, y ayudando a proteger nuestras costas. Apreciamos mucho la generosidad de nuestros colaboradores y esperemos su participación. Artifice; Asociación de Guías; Bahia Ballena Tours; Ballena Info Center; Bodhi Surf; Costa Rica Cultural Tours; Cristal Ballena; CuidArte; Cuna del Angel; Flutterby House; Hotel Vista Ballena; Kura Design Villas; Licorera don Isreal; P.N.M.B. Give a Saturday to your community to make it a better place. From now through August, join us for Surf and Service Saturday’s in PNMB to do community service. For those who participate in the service activity, surf lessons will be offered, focusing on the youth. We will also have soccer on the beach or just enjoy the beach with other participants. 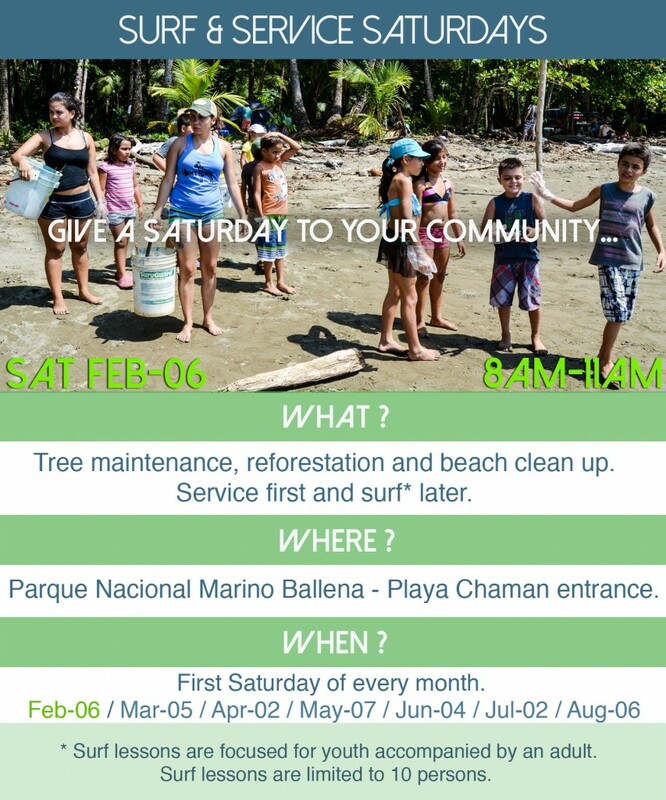 The service activities will vary by month, but the focus will be on maintaining trees planted in the park as part of the Semilla de Ballena project, doing beach cleanups, and helping to protect our coastline. All are welcome to join. If you are a business and wish to become a monthly supporter of this Surf and Service Saturday Initiative please write Amy Work – amy (at) geoporter.net. We appreciate the generosity of past collaborators and look forward to your participation. This entry was posted in community, Events and tagged Surf and Service, Surf and Service Saturdays, Surf y servicio by geoporter. Bookmark the permalink.